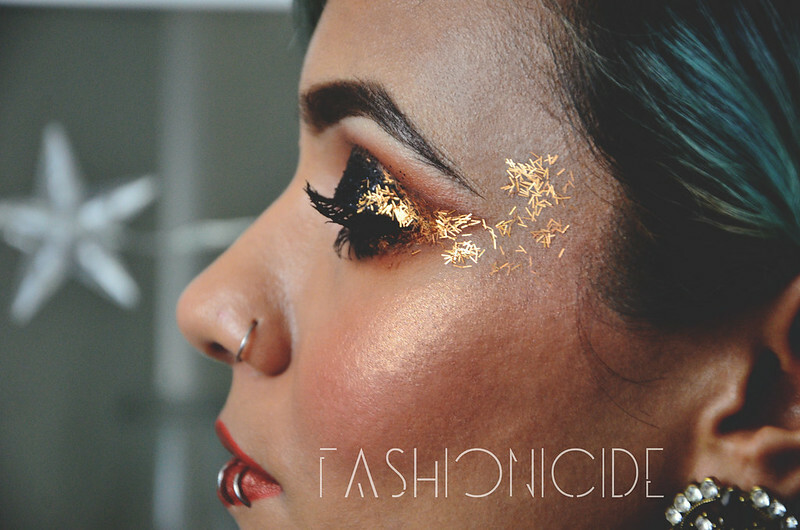 My first thought was of all the makeup looks I could create with them, given that I had 24 different colours of glitter in various different styles too. Some were your typical medium-milled glitters, others were a little thicker and others still had different shapes to them as well - just think of all the fun! 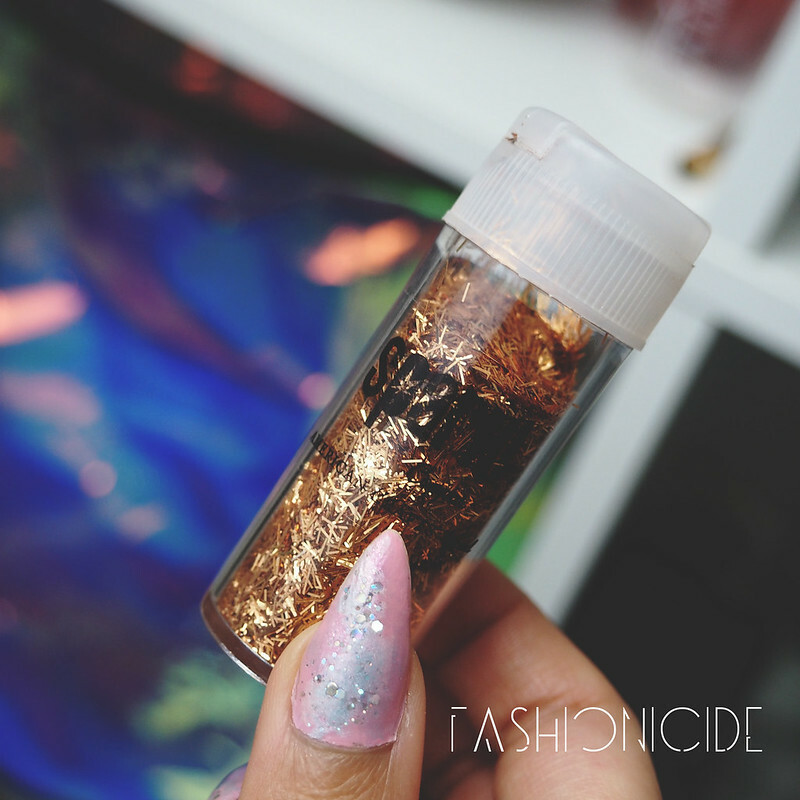 So I patiently waited until the weekend, and thought I'd give the Copper Tinsel Glitter a try - after all, we all know that copper is *gulp* ON TREND. I didn't really plan it out very well though, I just thought I'd go for a little improvisation and see what I ended up with. I covered my eyelids in black eyeshadow, also applying it beneath the lash line. 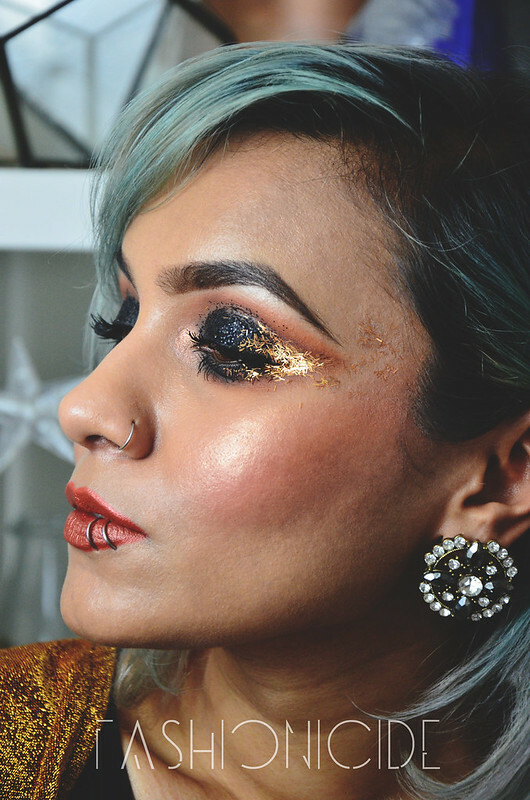 I then applied Lime Crime's Glitter Helper on the outer corners of my eye and applied the copper tinsel with a flat eyeshadow brush. It looked pretty spectacular, but also was lacking something. 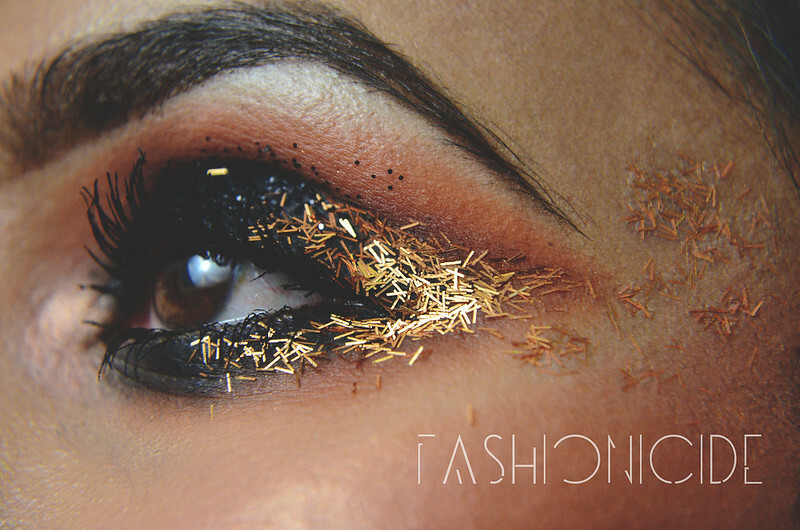 So I dipped into my new box of glitters, fished out a pot of black glitter and used Glitter Helper to apply it on to the eyelid. The final look is absolutely stunning, and I think that the photographs really do it justice. 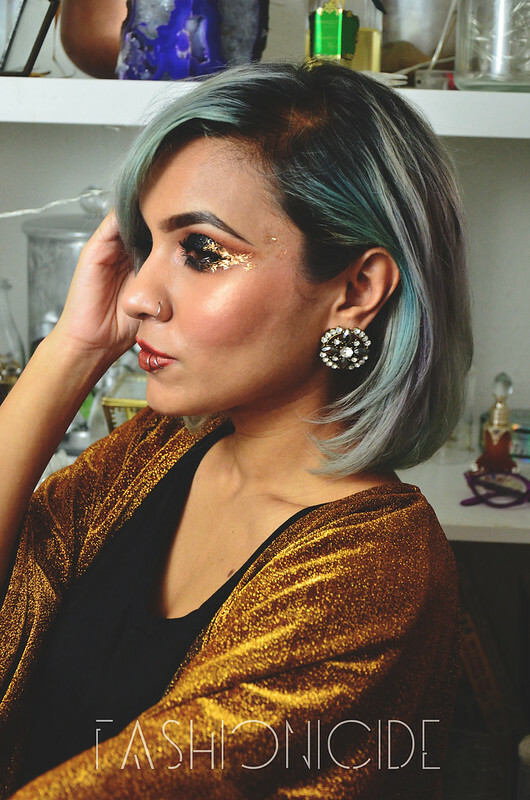 Lime Crime's Glitter Helper is perfection when it comes to applying glitter. I've always dreaded using glittery eyeshadows, and avoided using standard glitter altogether on my face, because usually you end up with glitter all down your face after an hour or two, but this stuff keeps it in place pretty much all day. In terms of removal, it wasn't too bad to take all this off at the end of the day. I just used some makeup remover and cotton pads to wipe it off. Glitter removal is never going to be fun, but Glitter Helper doesn't make it any more difficult at least! Continuing with the coppery theme, I went for Lime Crime's Perlees in Penny for the lips. It's described as a 'Bright Copper' which I'd say is actually bang on, though it does verge slightly over towards a coppery-red, as opposed to an outright copper. Regardless, it looks stunning and I love the metallic sheen it gives off! That is such a pretty look on you! And well done for your bargain buy! You pulled another incredible look out of the bag! You are totally my inspiration! Wow, stunning. LOVE this and have never seen anything like it. Cool effect! Girl I LOVE how this turned out. It looks like something Cinna would have had put on Katniss Everdeen in Hunger Games, which I guess is also *gulp* on trend. Haha! You really pull it off nicely. I want to try it <3 I recommend biore wipes for removing make up and glitter.. though, I've only tried it on the Too Faced glitter, myself. PS I think its funny and cute how in Europe it is TK Maxx and in the USA its TJ Maxx, curious difference. So beautiful ! And me looking for makeup for a carnaval , I will disguise myself cleopatre . This looks incredible, and so creative. However, I think I would make a total mess of it! Wow! This look is incredible on you it really suits you! You look absolutely magical! LOVE the look, so bold and beautiful! You always slay any makeup look! You are literally too inspiring! I love how you'd use this, I would never have thought of doing that! Great look. An love this creation of course! Everytime you post a make-up look I find my jaw on the floor. They are always beautiful! I love copper, and I love black, so this is a total winning combo for me!